Park Lawn Awareness Week is official in Seven Chicagoland South Suburb cities during the week of January 23 to January 30. Park Lawn is a non-profit organization that offers an array of programs (http://parklawn.presencehost.net/about_us/programs.html) for more than 450 individuals with intellectual and developmental disabilities. The participating cities and villages recognizing Park Lawn Awareness Week include Oak Lawn, Worth, Orland Park, Evergreen Park, Palos Park, Palos Heights and Chicago Ridge. In recognition of Park Lawn Awareness Week, friends in the community are encouraged to show their support by wearing Park Lawn’s color, blue, on Friday, January 28. This was initiated by Park Lawn guardians Charles and Maureen Reilly, whose child Kyle is enrolled in Park Lawn programs. Maureen is a board director for Park Lawn and is a member of the Resource Development Committee. Charles and Maureen are active in Park Lawn’s auction committee for the upcoming February Auction, “A Rhapsody in Blue”. It is the hope and intention of the Reilly family and all supporters of Park Lawn that this will be an annual event to continuously bring awareness of the beneficial programs for hundreds of individuals with intellectual and developmental disabilities. When an individual is diagnosed with intellectual and developmental disabilities, it can be considered mild, moderate, severe or profound. Park Lawn helps adults with a wide variety of disabilities from mild to profound. Deputy Executive Director Julie Grounds explains that Park Lawn works with guiding people through each aspect of their daily lives all the way up to helping people write their own personal checks. While the primary disability is mental retardation, in most instances it is accompanied by physical disabilities, behavioral challenges and medical needs. Park Lawn was founded in 1955 by ten families from Evergreen Park and Oak Lawn, creating the name Park Lawn. These parents were determined to provide education for their children and began by holding classes in rooms donated by local organizations. By 1968 the group raised enough money to erect a school in Oak Lawn and hire staff. As the children aged and their needs changed, Park Lawn expanded its programs. Today Park Lawn’s programs are throughout the Chicago South Suburbs and include adult developmental training, vocational training, supported employment, high school transition, a senior program and 9 residential facilities. Park Lawn was awarded a three year accreditation renewal by CARF (www.carf.org/home/), a rehabilitation accreditation commission, in 2009. We are recognized by the Illinois Department of Public Health (www.idph.state.il.us/); the Illinois Department of Public Aid (www.dpaillinois.com); and the Illinois Department of Human Services (http://www.dhs.state.il.us/page.aspx) for excellence in providing services for individuals with intellectual and developmental disabilities. Park Lawn also enjoys the support of hundreds of volunteers and donors. Along with the 14 board members who volunteer time and event volunteers, Park Lawn engages in a collaborative program with Marist High School, where fifty high school seniors volunteer each day to help with client programs. Other ways to support Park Lawn can be found at www.parklawn.com/events. Tickets are still available for the February 19th First Annual “A Rhapsody in Blue”. This elegant new live and silent auction will replace Park Lawn’s Zazz Singles Auction that was held the past 21 years in February. The reason for the change was to bring the live auction back to the South Suburbs that focuses more on Park Lawn’s mission. Park Lawn is also looking for volunteers willing to collect donations on April 15 / 16 and 22 / 23 for Tag Days: Miles of Smiles. Park Lawn will provide all of the supplies that include a bright orange safety vest with Park Lawn’s logo, a collection bucket with Park Lawn’s logo and a tag with information about Park Lawn along with a piece of candy to thank generous donors. This event is perfect for students who need to earn service hours for confirmation or graduation. The mission of Park Lawn is to provide services that promote independence, choice and access to community for people with intellectual and developmental disabilities. For further information about ways to volunteer or donate to continue the programs at Park Lawn, visit www.parklawn.com or call 708-425-3344. Photo Caption: Park Lawn participant Kyle Reilly (left) with his friends from Park Lawn Dana and A.J. 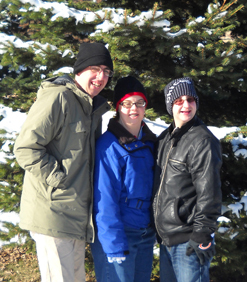 Kyle is the son of Charles and Maureen, who help initiate Park Lawn Awareness Week during January 23 – 30.